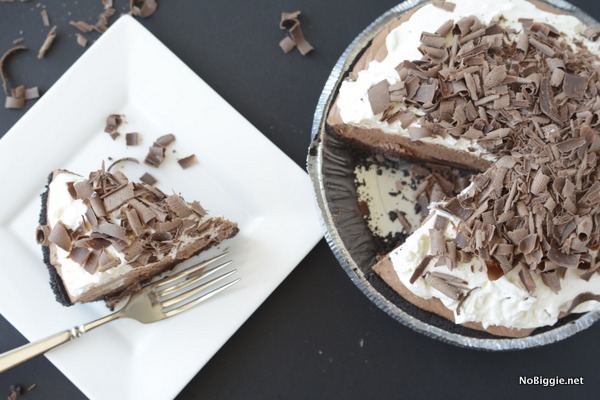 Chocolate Truffle Pie…layers and layers of rich chocolate all in one pie. The creamy cool layers of this pie is what your chocolate dreams are made of, seriously it’s pretty heavenly. Okaaay…Are you ready for this?! 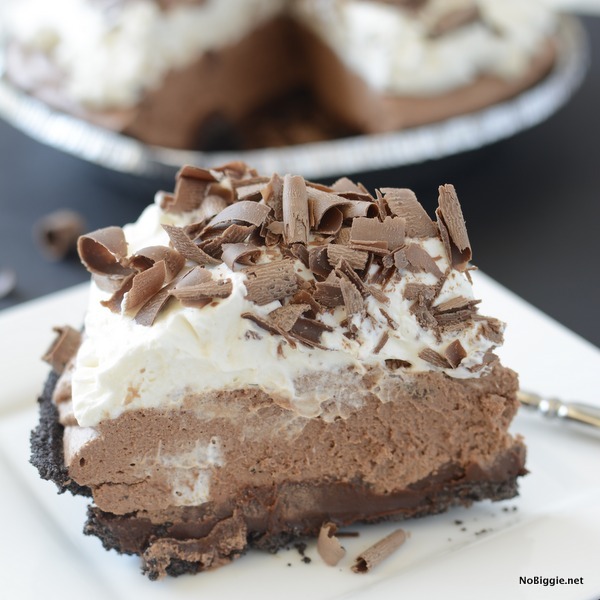 There are basically 5 layers for this pie…it might sound more time intensive than a regular chocolate cream pie, but it’s sooo worth it! It would be the fan favorite at a dessert party for sure. 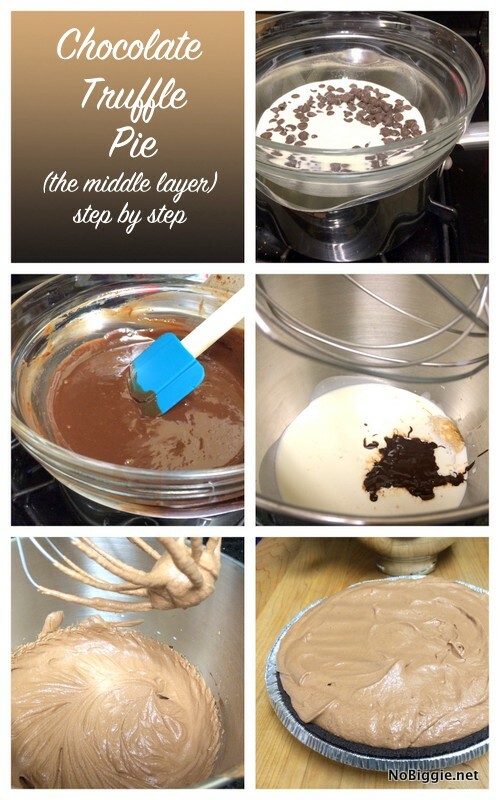 Start with the chocolate truffle filling, the bottom layer: In a saucepan, bring 2/3 cup of cream to a simmer. Place 6 ounces of bittersweet chocolate chips into a medium size bowl and pour hot cream over the chocolate. Let stand for 1 minute, then gently whisk until smooth. 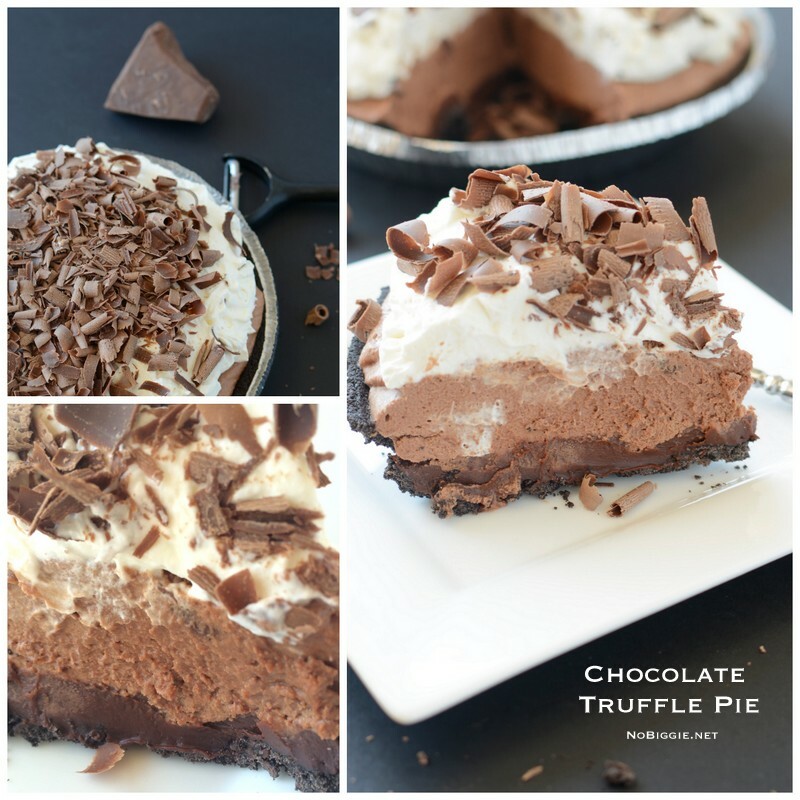 Spread the truffle filling over the bottom of the oreo cookie pie crust. Freeze for 20 minutes. Next work on the -whipped chocolate filling (the middle layer). 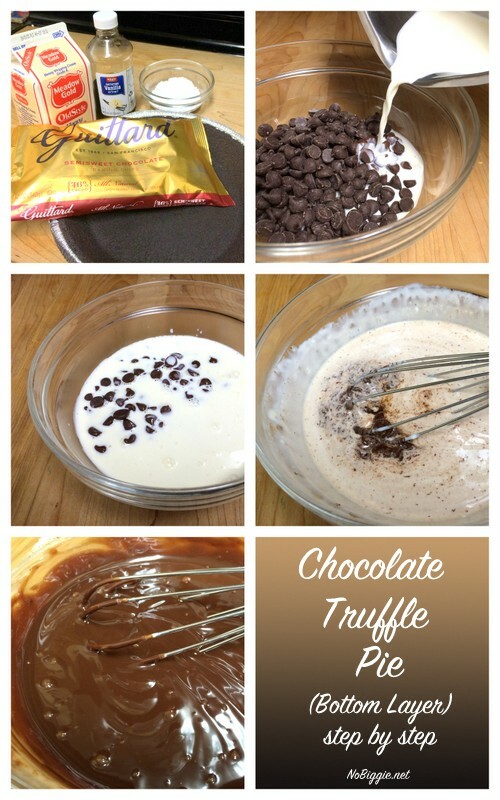 Using a double boiler (or microwave set on low power), heat the 6 ounces of chocolate chips with 1/2 cup of whipping cream until the chocolate is just melted, stirring often. Let the mixture cool to room temperature. In a chilled bowl, whip the chocolate mixture with 1 cup of whipping cream and vanilla until soft peaks form. 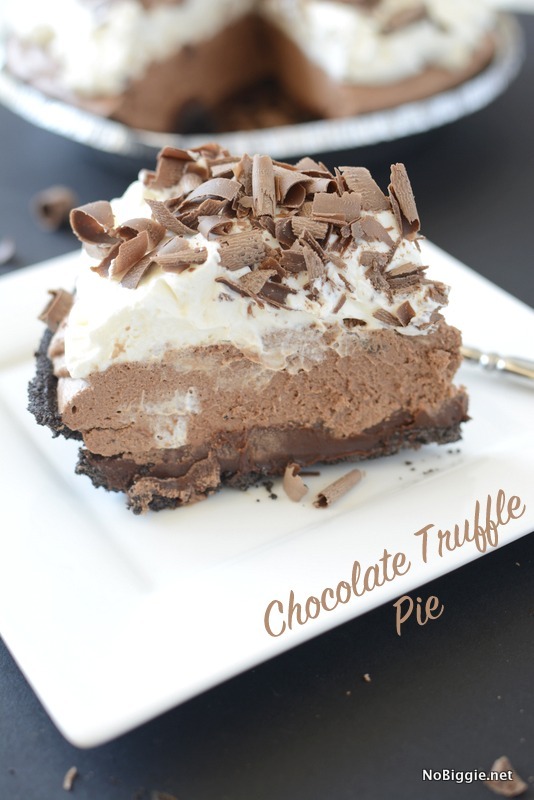 Spread the whipped chocolate over the truffle filling in the pie crust. Refrigerate over night. Just before serving, whip 1 cup of cream and powdered sugar until stiff peaks form. 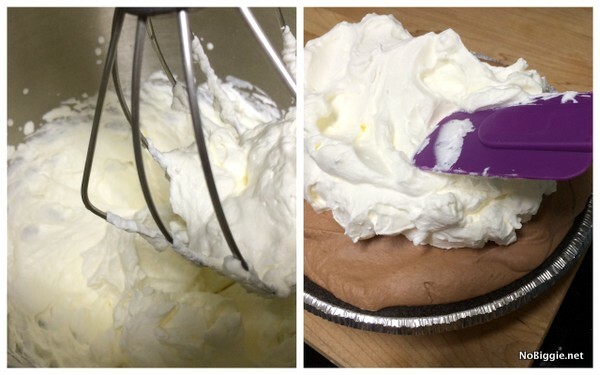 Spread the whipped cream over the top of the pie. 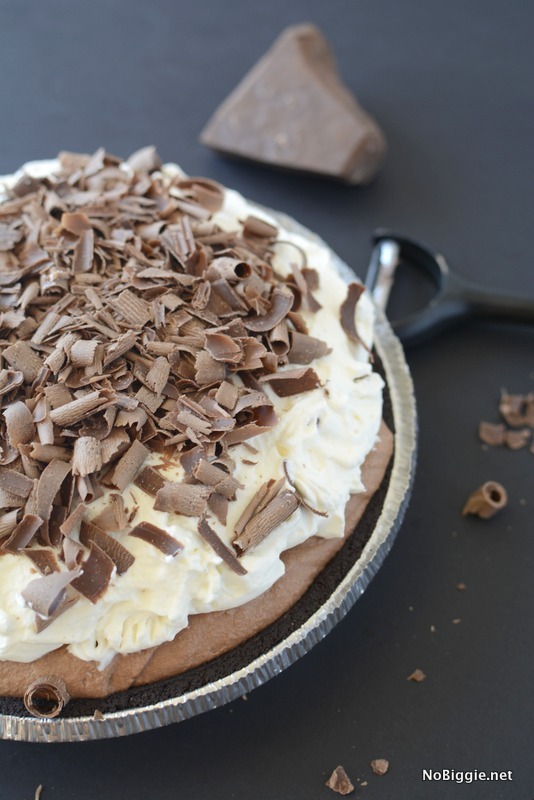 Garnish with milk chocolate shavings: Using a vegetable peeler, create chocolate curls to garnish the top of the pie. Serve immediately with the whipped cream top layer. *This pie stays good in the fridge for a few days, if put in an air tight container. So excited for you guys to try it! *Recipe by Marie, all photos by Kami for NoBiggie.net – more posts by Marie. Saw this on instagram and knew I had to try it! I put 1/2 tsp vanilla and 1/2 C powdered sugar with the 1 cup of cream for the topping and it was perfect Thanks for the recipe! Can I use cocoa powder instead of using the chocolate chips? Hi Maria! We don’t recommend changing the recipe on this one because it will change the texture of the pie. Thanks for asking.